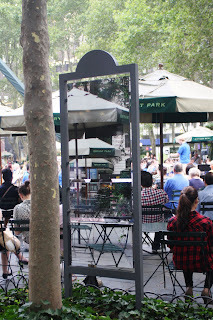 Observant visitors to Bryant Park are noticing something delightful about the reverse sides of our information signs. Until recently, the signs’ backs were, like the backs of most free-standing signs, blank and visually disruptive to sightlines in the park. Bryant Park Corporation had long sought an elegant solution for the aesthetic problem that these utilitarian objects present. Then a while back, BPC President Dan Biederman visited the Playa Vista project near Los Angeles Airport, and noticed that some purely functional streetscape objects, such as utility boxes, were cleverly camouflaged with photographic images of what a viewer might see if the object were not there. 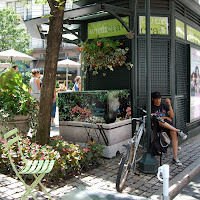 A BPC staffer contacted the artist responsible, Joshua Callaghan, and soon we were collaborating with Callaghan for a similar project in Bryant Park, and Herald and Greeley Squares in the 34th Street Partnership (34SP) Business Improvement District. 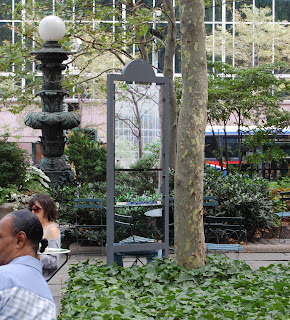 We selected the backs of five information signs at Bryant Park, and two utility boxes at Herald and Greeley Squares, for the treatment. “For the backs of the signs at Bryant Park, we chose to simply camouflage the objects with images of what is on the other side. But in the case of the utility boxes in Herald and Greeley, we had an opportunity to portray a fantasy of what might have been there, such as horticulture or movable chairs,” says Julie Ember, BPC/34SP Industrial Designer. The photographs are, depending on a park visitor’s attention to detail, attractive or invisible. Either of those possibilities works for us. The prints were made by a state-of-the-art Plug Digital printer, using environmentally friendly solvent-free ink, and are mounted on vinyl that is resistant to UV rays and graffiti. Next time you’re in the park and you walk by an information sign, check out the back. We think you’ll get a kick out of it.